Pop Culture Junkie: Pop Culture Junkie: Free Gift with Purchase August 22-27! 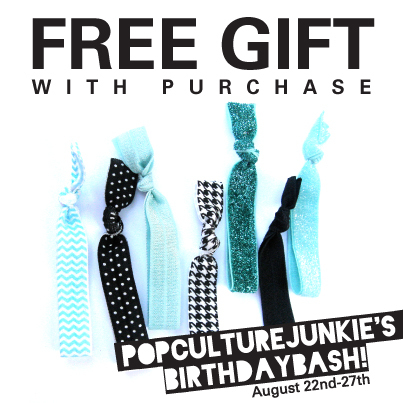 Pop Culture Junkie: Free Gift with Purchase August 22-27! All purchases now through Tuesday August 27th will receive a set of three FREE hair ties (while supplies last). These hair ties are great because they are more gentle on your hair, double as a bracelet and don't leave a dent in your hair!